Looking to update your stormwater modeling software? You’re in the right place. 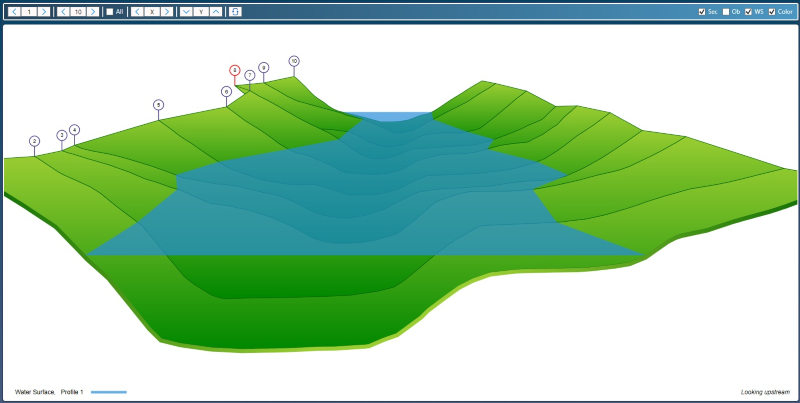 Hydrology Studio is a full suite of new-generation software for stormwater modeling. It includes detention pond design, storm sewer design and analysis, open channel hydraulics, culvert modeling, hydraulics calculators and more... With a delightful user-interface. Let’s face it. Most engineers hate the hydraulics and hydrology software they use at work. It’s outdated, clunky, hard to set up and expensive. Countless hours are wasted struggling with spreadsheets and obsolete stormwater modeling software. You deserve better. Hydrology Studio and its companions are hands-down the most intuitive and easy-to-learn stormwater modeling tools available. Our software is stand-alone and features new and modern user interfaces with advanced graphics. They’re powerful enough for the largest engineering firms at a price point that works for anyone. Whether you or your team is engaged in urban stormwater modeling, detention pond design, storm sewer design, culvert hydraulics or open channel modeling, Hydrology Studio has you covered. See why hundreds of other civil engineers, consultants and approving authorities have switched over to Hydrology Studio to produce higher quality drainage designs. Start fresh. Spend less time on guesswork. And do more great work. How is Hydrology Studio Better? It’s new and modern. Our software employs the latest programming technology and engineering methods that help you produce best-quality stormwater designs and associated deliverables. 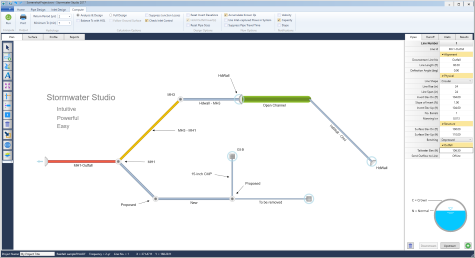 Easier workflows, outstanding graphics and reporting you’ll be proud of. These programs are feature-rich; graphics rich; easy-to-learn; requiring no other software; fairly priced and updated often. They employ rock-solid, time-tested, fully-documented stormwater calculation methods you and your peers will trust. They simplify your workflow — something everyone appreciates about great stormwater modeling software. They’re ridiculously easy to use. You’ll pick them up in minutes, not hours, days or weeks. They install on your PC with a single mouse click and are compatible with Windows 7, 8, 10 and beyond. Built for the future. Easy and simple licensing. They’re perpetual. They never expire. No surprise invoices. They’re a 100% satisfaction guaranteed. If you’re not satisfied, we’re not satisfied. We’re focused and do one thing really well… hydraulics and hydrology software. Hydrology Studio uses an intuitive, on-screen watershed routing diagram that lets you point and click your way through site developments and complex watersheds. Create runoff hydrographs, combine, route and divert hydrographs. Interactive detention pond design. You’ll design detention basins and ponds within minutes in three easy steps! Professional, agency-accepted reports with colorful, informative graphs are designed to impress anyone who sees them. You’re in good hands with Stormwater Studio at your fingertips. Using HEC-22 methodologies, it provides you with automated design & analysis capabilities; true energy-based HGL/EGL calculations; graphic-rich surface and profile plots; flexibility; speed and a feeling of confidence knowing you’re using an agency-friendly program. All at a price that makes Stormwater Studio as easy to buy as it is to use. Replace your outdated culvert design software with something new and better. Culvert Studio offers a rich user experience with rock-solid, time-tested results. You can model single-barrel crossings, multi-barrel culverts with a variety of shapes, sizes, slopes, inlet configurations and materials. Flow regimes include subcritical and supercritical flow with hydraulic jumps and overtopping flow. Ease-of-use and high-end graphics are this program’s trademark. Channel Studio is software purposely designed to be an easy-to-use tool for performing day-to-day hydraulic analysis on open channel systems and floodways. 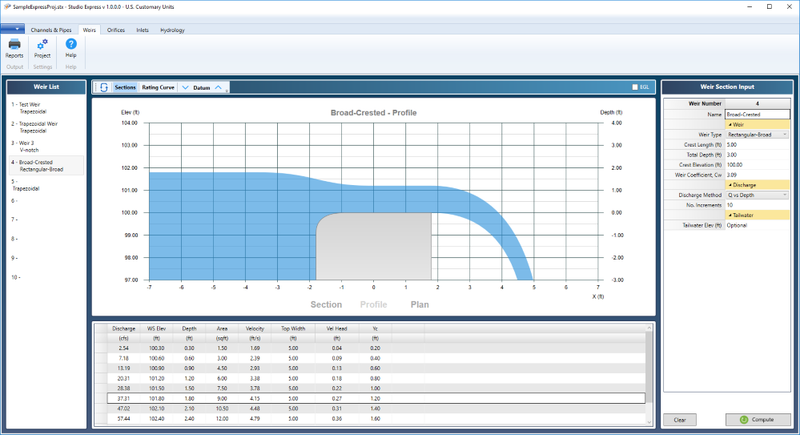 Use Channel Studio to compute water surface profiles for any open channel including bridge structures, culvert crossings and inline weirs. Draw realistic river reaches directly on your map, add cross-sections and compute. Also performs bridge scour. When you need answers fast, this is your go-to hydraulics and hydrology software. Model open channels, pipes, weirs, orifices and inlets…on the fly! 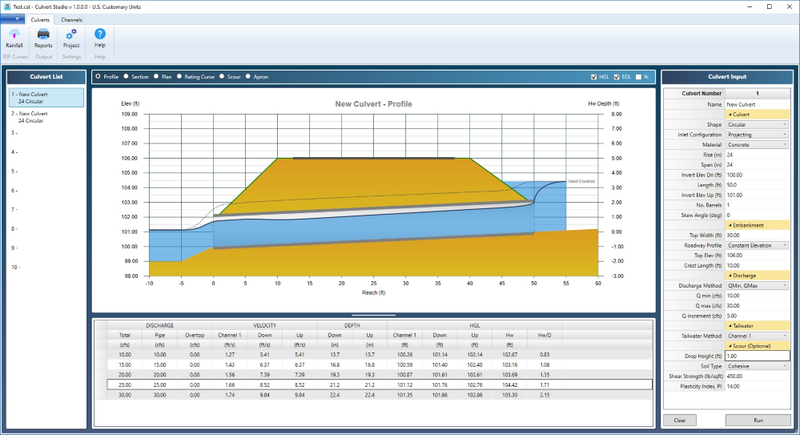 Create runoff hydrographs and estimate required storages for detention ponds.